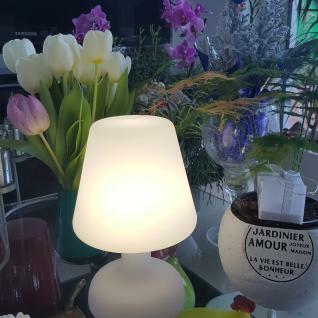 Light up your indoor or garden table with this stylish and portable LED lamp. This practical lamp adapts to your needs with a brightness that adjusts to 3 levels. With its very simple style, this lamp fits into any environment. It is self-contained and runs on battery power. You can enjoy its brightness everywhere, without being held back by a wire or limited due to a plug socket. It can also be used while charging. This decorative LED lamp is sturdy. Its shell is in an anti-UV treated rotomoulded polyethylene. This is a splash and shock resistant material. Made to meet standard IP65, the lamp can withstand water and dust. It can resist splashes but is not completely waterproof. It is supplied with a LiPo 3.7V, 1000mA battery. This LED lamp reaches full charge in 4-6 hours, for 10-20 hours of use. Its main advantage is the induction charger. 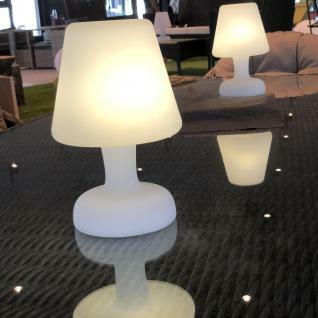 Simply place the LED lamp on its base for charging. You can find other models in our range to complete your collection. 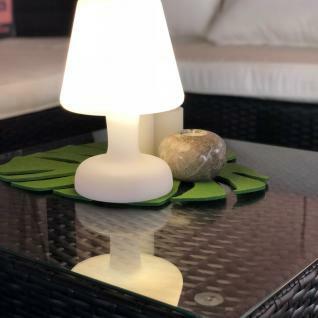 Although this lamp is designed for outdoor use, it is not recommended to charge it outside.